Convenient storage space for shopping, traveling and everyday use. Gray, vinyl-coated wire basket with snap hooks mounts onto the inside or outside of most regular and folding walkers. Dimensions: 18" L x 6" D x 5.2" W x 9 1/2" H.
Very pleased! Great quality! Mother loved the ease of being able to attach and remove if needed. Sturdy and perfect size! Great price too! I exspected to receive my basket with the order for my walker, but it was not in the box and I am still waiting for it. 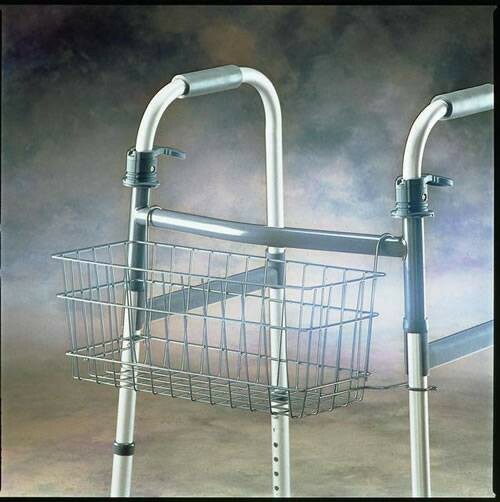 As far as the walker goes, it was a good deal on the price and will do just find, but I want my basket please.